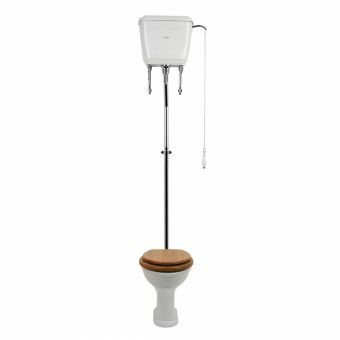 Free DeliveryImperial Drift High Level ToiletFrom £316.00 inc.VATRRP: £395.00 (Save 20%)High-level cistern, choices of seat colour and chrome or gold options on the brassware. 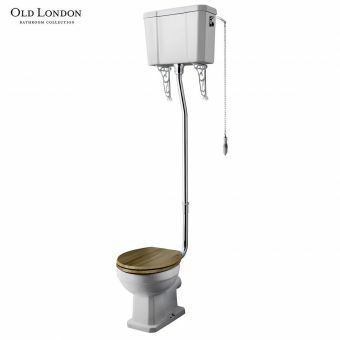 Free DeliveryImperial Westminster High Level ToiletFrom £364.00 inc.VATRRP: £455.00 (Save 20%)High-Level Cistern, seats to match in five colours, plus a choice of chrome, gold or nickel fittings. 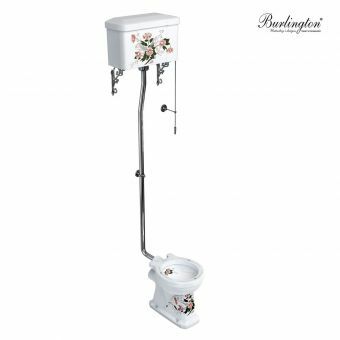 Burlington High Level ToiletFrom £295.11 inc.VATRRP: £454.00 (Save 35%)High level suite, with a choice of finishes available for the cistern including regular white or aluminium finishes. 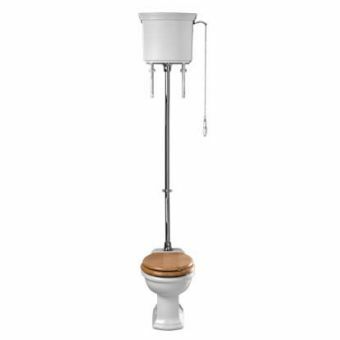 Perrin and Rowe Victorian High Level WCFrom £437.95 inc.VATRRP: £547.44 (Save 20%)Victorian styled traditional toilet for a classic period British look, perfect teamed up with a Victorian basin. 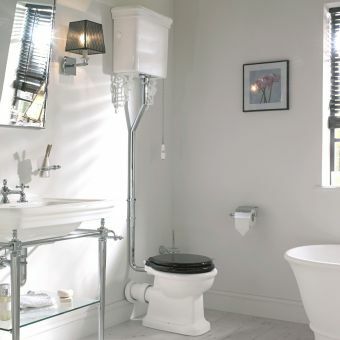 In the UK we have a tradition of Victorian style “high-level” toilets where the cistern would sit high up fixed to the wall with a very long flush pipe extending down and connecting to the toilet pan, older plumbing systems relied on gravity, so most tanks were installed high up, plus older style toilet bowls and flushing types were not as efficient as they are today, for example Villeroy and Boch’s latest direct flush systems are highly efficient and rimless. The high-level look is still available today, but with modern plumbing know how built in. This look can be achieved through a number of options across various brands at price points from the more affordable to the more luxurious end of the market. 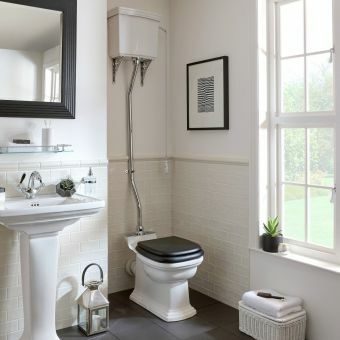 If you are looking for a more economical option in terms of budget we would recommend looking at Burlington and Old London as starting points, these brands offer excellent high level toilets with soft close seat options in contemporary classic colour finishes to suit any bathroom design. 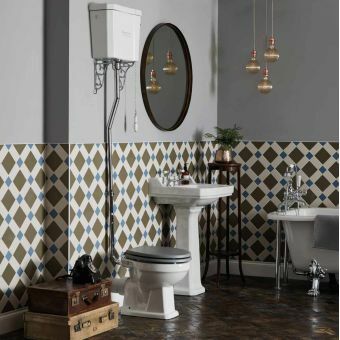 If you are looking for a touch of handcrafted luxury, a real investment piece of pottery crafted with superior care and attention we would not hesitate to recommend Imperial bathrooms. Their specialist ceramics factory in the midlands employs a workforce of expert craftsmen and women who pore over every detail of the product from start to finish, with a rigorous quality control and research and development department that are always innovating and improving designs. 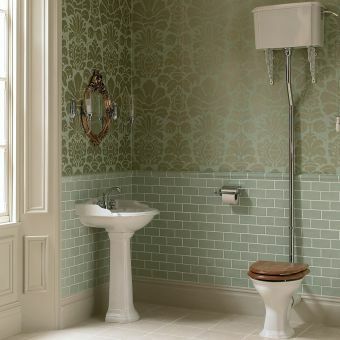 The Victorian look is very easy to create with a high level toilet as most designs follow a traditional aesthetic, some will have more highly decorative cistern brackets and more fluted ceramic forms should you wish to go more ornate in design. 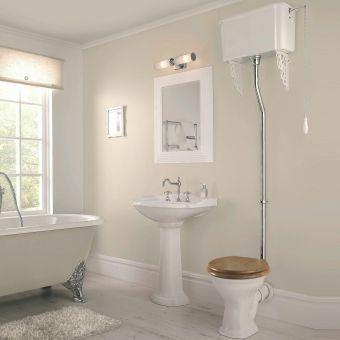 Imperial bathrooms also offer their high level toilets with a choice of brassware finish in chrome, gold or nickel. 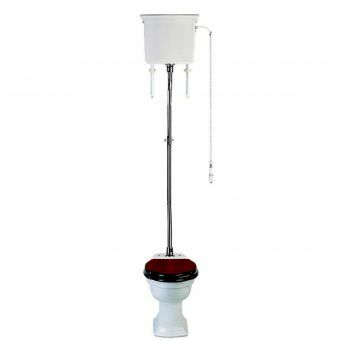 The brassware sections refer to all the metal fittings for example the pull chain, flush pipe and brackets, even the toilet seat hinges are plated in your choice of metal finish. 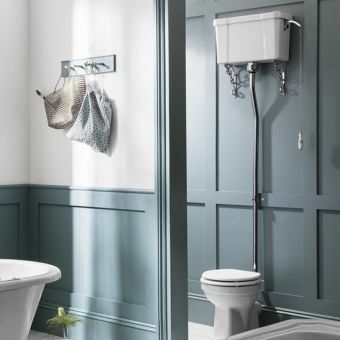 You can then match this up to your choice of brassware, for a perfect match we would recommend looking at Imperial bathrooms taps and showers in the same finish. Chrome is and easier match should you wish to use another manufacturers taps or showers different brands chrome plate finishes are more easily matched than say gold which can vary in depth and yellow tone. 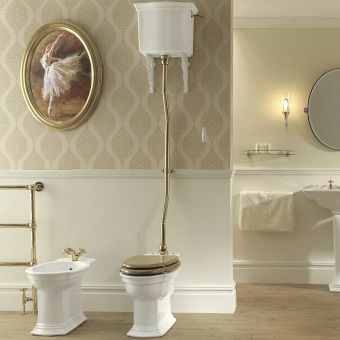 Your new high level toilet can be matched to other pieces in the same range by your chosen manufacturer, most brands will create complimentary bathroom sinks, bidets and even bathtubs to coordinate your entire bathroom design in a Victorian style. 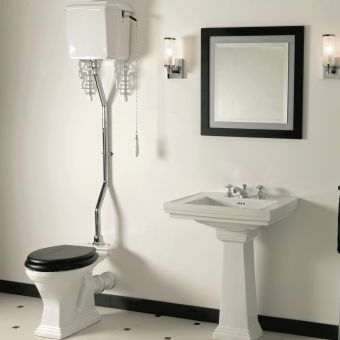 For example the lovely soft rectangle shapes in the Imperial Radcliffe high level toilet are echoed in the matching basin with an option of a full pedestal or a well-appointed washstand in the metal finish of your choice to match your high-level toilet brassware.